The Shervin family recently completed an all-expenses paid trip to the interactive theme park LEGOLAND Malaysia as part of their prize for winning the Kiddies & Toys International (KTI) consumer promotion. The promotion, which took place in December, garnered great excitement amongst loyal customers and fans of KTI’s stable of branded toys. “This was a fantastic experience that brought us all closer together. From the attractions to the rides, we were entertained from the moment we stepped foot in the park. However, I still can’t believe I won this amazing prize. From the moment I found out it felt like I was in a dream. I had always bought my grandchildren LEGO, Barbie & Hot wheels because they are the world’s most trusted brands which are both high in quality and entertainment value. My grandchildren also love them but I never imagined we would be able to visit LEGOLAND because of them. My family and I are thankful to KTI for this highly enjoyable prize,” said Mr. Shervin. To be eligible for the prize customers had to purchase Rs 7,500 worth of KTI products from any Cool Planet store between the 1st and 31st of December. For each Rs 7,500 spend they received one coupon for the raffle draw. 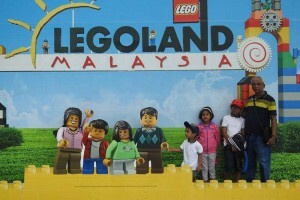 The winning family of four received an all-expenses paid trip to LEGOLAND Malaysia. Kiddies and Toys International (Pvt) Ltd, Eguardian Lanka (Pvt) Ltd, DCS International (Pvt) Ltd and Digital Engineering Solutions (Pvt) Ltd are the main subsidiaries of LIMRA Holdings. The subsidiaries represent world renowned brands in their respective fields such as Farlin, LEGO, Chicco, Leapfrog, Mattel, Eset, Fortinet, Symentec, HP. LIMRA Holdings which has business interest in industries of ICT, mother care, baby care, toys, and engineering is mandated to identify, invest, acquire and manage business ventures profitably.